French paintings of ladies dressing and at their toilettes provide us with an insight of how dressing rooms were once constructed and used. 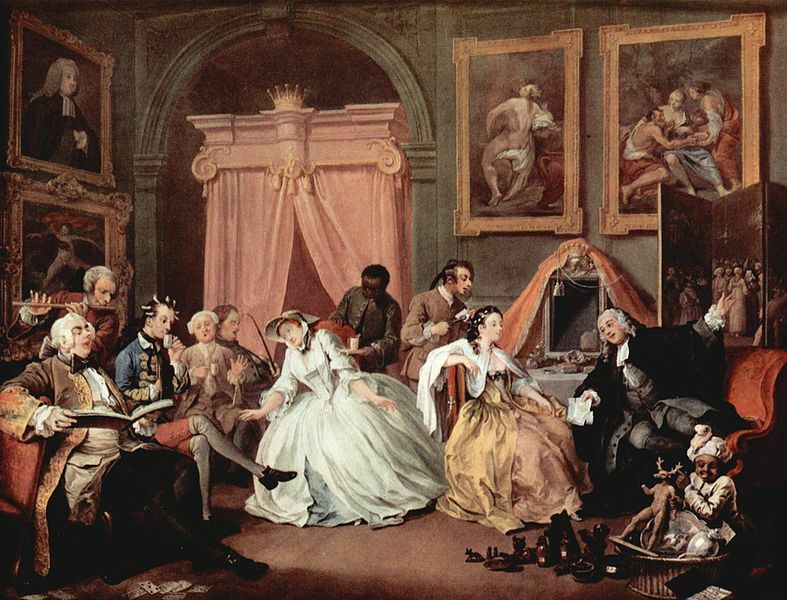 While we think of dressing as a private affair, William Hogarth demonstrates in his painting, Marriage à-la-mode: The Countess’s Morning Levee, how a woman of means with a large elaborate dressing room would entertain visitors while she was completing her toilette. In reality, the toilette became a ritual in 18th century France for the very rich, one that had both intimate and public elements. A maid would groom and sponge bathe her lady in private, but then her mistress would devote hours to having her hair dressed, eating her breakfast from a tray, writing letters, entertaining friends, and picking the clothes she would wear for the day. The wealthier the woman, the more elaborate her morning ritual. 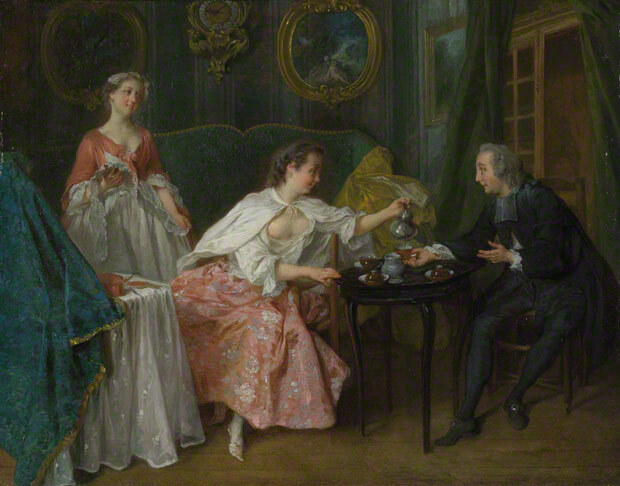 As Hogarth showed, the custom of entertaining guests in one’s dressing room was also popular in England. In the image below, a shameless young lady is entertaining her spiritual adviser in her boudoir. His expression is priceless. These various senses are first recorded by the OED (Oxford English Dictionary) in rapid sequence in the later 17th century: the set of “articles required or used in dressing” 1662, the “action or process of dressing” 1681, the cloth on the table 1682, the cloth round the shoulders 1684, the table itself 1695, and the “reception of visitors by a lady during the concluding stages of her toilet” 1703 (also known as a “toilet-call”), but in the sense of a special room the earliest use is 1819, and this does not seem to include a lavatory. Woman’s Fashions of the 18th Century fully describes the above painting by Boucher, in which the seated woman, probably a courtesan, is tying a garter over her stocking while wearing a short jacket to protect her outfit from particles of applied makeup and the powder on her wig. No visitors invade this intimate scene, which clearly shows a tray with refreshments and a decorative dressing screen behind the chair. James Gillray portrays the progress of the toilet. Note the wash basin and water urn on the floor. Women did use their dressing rooms at more intimate and private moments, when one presumed they would be alone. The washing of one’s face, feet and hands was a daily ritual, while bathing one’s entire body was not. Such ablutions were done privately. People would wash in basins. A portable hip bath would be placed in the dressing room if they decided to bathe completely. While outhouses were common, the wealthy tended to use elaborate potty chairs (see image below). 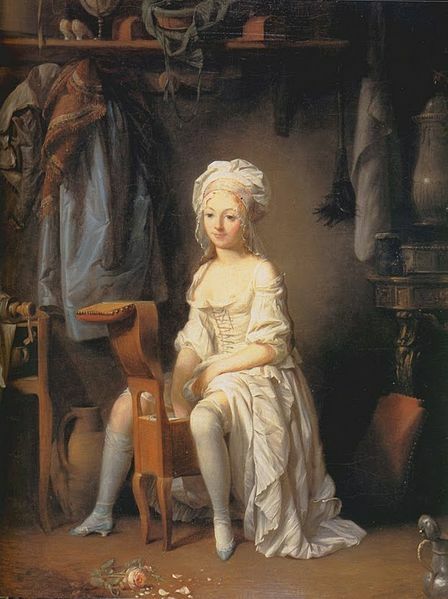 The French used bidets inside their dressing rooms, as shown in Boilly’s painting above. Invented by the French, their earliest recorded use was in 1710. If one wonders how women in elaborate costumes managed to go to the bathroom, this image by Boucher provides a glimpse. The handling of the bowl and upright posture was possible, for women during that era wore no underdrawers. 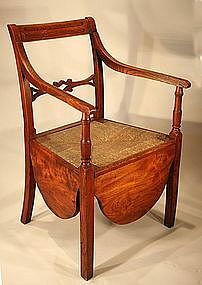 Dressing room with chamber pot chair, 1765. Image@Morris Jumel House, Manhattan. Anthony Trollope made an interesting point. During the 1860’s, when his novel was written, wealthy women changed their wardrobes more often for different functions during the day than Regency women. She invites Alice to linger in her dressing room, presumably to rest, read, and drink tea, rather than change into yet another set of clothes to join the company downstairs. Lady Glencora also indicates that the dressing room could also be a refuge away from visitors and prying eyes. 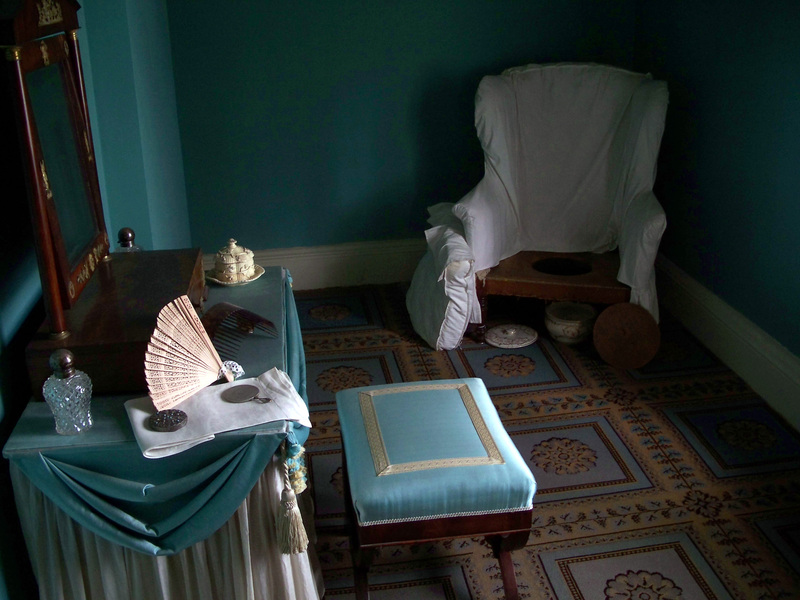 Jane Austen's bedroom. The closet with wash basin and potty sits to the left of the fireplace. A wealthy couple might have two bedrooms (his and hers) with an adjoining sitting room. Each person would have their own dressing room. Simpler households did not have the luxury of such space. 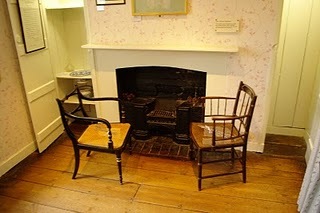 In Chawton Cottage, Jane Austen and her sister, Cassandra, shared one bedroom. Their potty and wash basin where stored in a closet. Today’s walk in closets with adjoining bathroom most closely approximate the dressing room of yore, although people today do not tend to entertain their visitors in their closets. I must thank Silouette: Hygiene of the 18th-19th Centuries for providing me with the inspiration for writing this post. Really interesting how what we think of as a very private place, was once just the opposite. The Lancret painting depicts an infant’s cradle. Perhaps it’s the father coming to see the child? If you refer to the object the woman is facing, that is a dressing table. The mirrors were often draped so the back of the mirror was covered – as was the back of the dressing table. 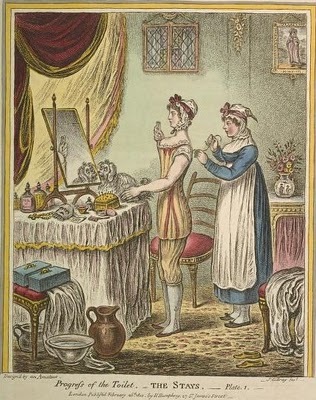 During the era of powdering hair, the mirror itself was often covered during the process to prevent the fine powder (attracted to the glass) from obscuring the image of the person. I found this article delightful as it has always been a question asked by all todays women. you should add a picture of a bidet stool, that is, a low 20 x14 stool with a china bidet pan insert. Padded top lifts off. Very interesting! I have often wondered about women using the facilities in all those skirts and I had already read about the public aspect of ‘dressing’ in one of Georgette Heyer’s novels. It’s interesting how in some aspects we are more open in our modern age and in others we are less open about things. I have always been interested in their rituals after reading so many regency novels…thanks…this provides a good insight into the period!!! For some reason, the photos aren’t showing up on my page. They truly do make a difference when they are there. I will try a different browser. It was my browser. I switched. What a difference pictures do make. This is an interesting post as are all. This reminds me of the scene in the Kirsten Dunst “Marie Antionette” movie where the whole royal court is there to dress her. The French court at the time was quite unbelievable. It is interesting to see and read this here. I agree with Sally Michelle Shaw that it is interesting how we are so open about things and so modest in others just as the people of earlier times. A few years ago, I found a website that discussed how women dealt with menstrual issues. It was quite interesting about the variety of ways they handled that. If I can find the site again I will send you a link. What an interesting and informative post! I always learn a lot when I visit your blog. Great info and pictures. It will help me visualize as I read as well as write. Thanks so much! There is something that puzzles me about dress at this period; a friend who has studied the history of costume told me that in this period women’s dresses were all two-piece, i.e., the bodice separate from skirt. But how can that be with the empire silhouette? It seems impossible to me that those garments could be anything but one-piece frocks. Does anyone know if my friend is correct? Thanks. But I remember in school, we girls would always go to the bathrooms in packs. I think it holds true for women at restaurants as well. Maybe it’s genetic! As usual, a wonderful post, Vic! I have wondered how one managed, and this answers several questions. Thank you! Very interesting, Vic. I was recently researching the practice of gentlemen conducting business with visitors while dressing, but hadn’t thought through the ramifications for ladies. As always, a fascinating post. Beau Brummel came to my mind as an example of someone that people made arrangements to come and watch him dress. They wanted to know how he achieved his cravat, etc. A woman holding a sense of “court” whilst preparing for the day or an event mystifies me. I can see a woman sensing power when the high and powerful visit her even while she prepares her toilette. I just read the Shire Libraries book on Water Closets and Privies. No mention of toilettes there to accompany others in attendance. @mitchell actually that’s true that the dresses during that period were two-pieces but they are tied in such a way that they look like a flowing garment but yup, it is a little confusing in the novels to find it out…I noticed this trend in some movies!!! My ancestor (born 1729, died 1801), noted in one of his journals the ‘correct’ pronunciation for the word ‘toilet’ as being ‘twaylit’ which I think is rather nice! That would have been in around 1780, in London. thanks mike. that’s very interesting, i must admit i had thought it was pronounced more like the modern Pronunciation of ‘toilet’. And here’s me thinking that it is pronounced “twah-Lett”. I have always understood, in modern parlance, that boudoir meant a woman’s bedroom and when referred to that today carries a sense of sensuality. 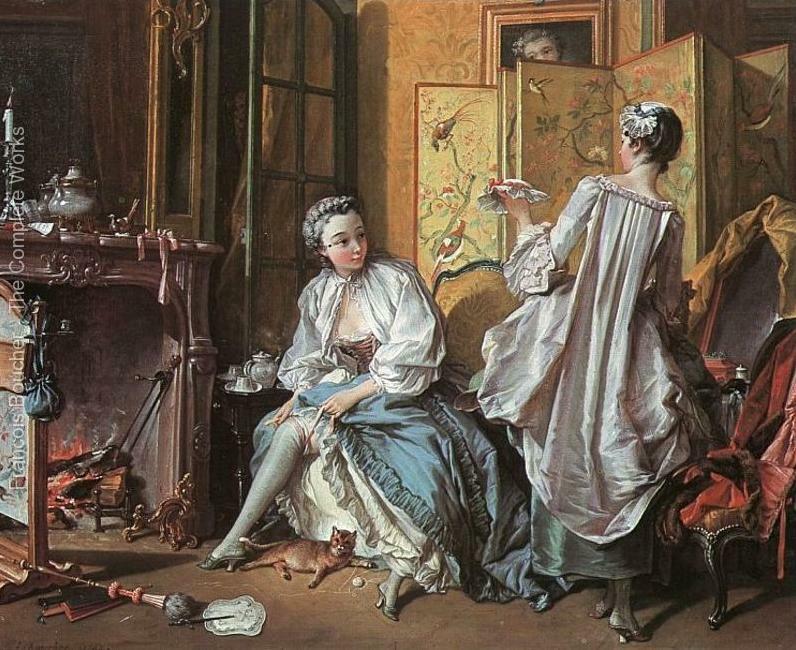 I have read that in the 18th and 19th centuries that a boudoir is more of an office where a woman might do her correspondence and possibly receive visitors. I’m a little confused by the use of the term. Can you elucidate on that topic for me?